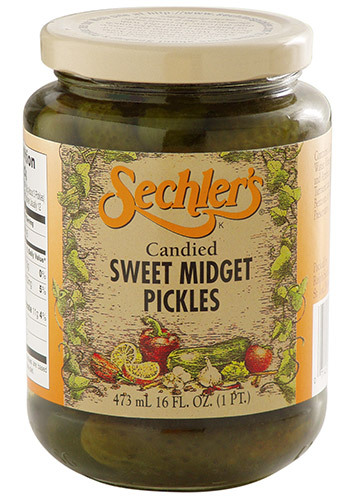 16 ounce Candied Midget pickles are our smallest pickle. It is sweetened twice for a flavor infusion throughout the entire pickle. Have purchased for a long time! From Anonymous of Bluffton , South Carolina on 12/9/2018 . Even though I moved from Indiana, my self and grandchildren have to have these. From William Hobbs of Sanibel Florida, Florida on 6/8/2018 . Secular pickles are the best sweet pickles I have ever tasted. From Anonymous of Pickerington, Ohio on 8/21/2017 . Tasty pickles, and the brine is indispensable for making egg salad, deviled eggs, and potato salad. From Sue Crowe of Greenwood, Indiana on 1/19/2017 . From Kip Hamilton of Marion, Indiana on 11/7/2016 . Best pickles in the world. No others as good anywhere.